You get a private database that keeps you in control. 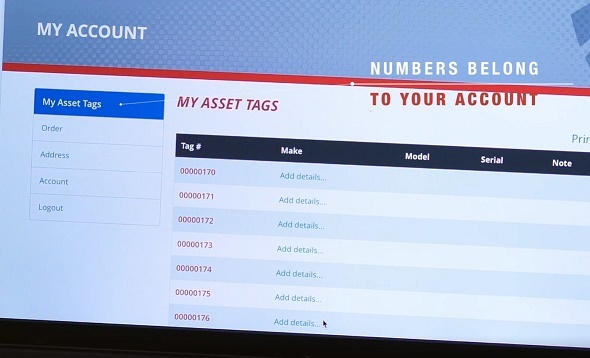 In other words, if someone recovers a piece of marked property and enters the asset tag ID number into the FOUND page, he or she will learn nothing about you. The system is akin to the anonymous email-relay used by Craigslist. Like Craigslist, it’s very important that you use good precautions when attempting to recover property. Our system goes by another name: proxy-marking. Proxy marking is what the police-endorsed Operation Identification strategy is all about. The enterprise asset management strategies that are used by corporations, universities governments and hospitals are the same. The other critically important tool embedded in the database is the centerpiece of what the My Property ID Registry security system hinges on. It’s the hardest thing to get citizens to do. It’s the recording of the make, model and serial numbers of portable valuables. Would you like a hug from a cop? Don’t just put up a yard sign to support the police. Don’t just put a piece of blue tape across the back of your car to support the police. Do what the cops beg you to do. Keep a record of the make, model and serial numbers of the portable valuables burglars target. It’s a simple act: record the make, model and serial numbers of the portable electronic burglars target. How desperate are the police to get you to do this? These are actual police officers doing the acting in this public service ad, trying anything to get citizens to help. The police really need your assistance. Sometimes it’s the little things that make a big difference. While Operation Identification is free, the My Property ID Registry system is an easy and online approach that charges a one-and-done fee that includes everything you need to do your part.